The truth is that designing a site for mobile phone and tablet browsing is just as important as designing one that looks great on a computer screen. According to PewResearch as of May 2013 63% of adult Americans use their cell phone to browse the internet, and 34% go online mostly via their phone. With the increasing popularity of both smartphones and tablets those numbers are on the rise. So, we strongly believe that you need a site that looks and functions wonderfully no matter how your visitors are browsing it. The solution is Responsive Design. Responsive design is a method of website design where a websites elements shift around to fit different screen sizes. Rather than showing the desktop version of a site in a much smaller size on a smartphone, the design shifts from one medium to another so that it is easy to read and navigate no matter what device you’re using. If you don’t have access to a smartphone or tablet thats ok! You can resize your web browser and watch the elements of the site shift to accommodate the smaller size! Which types of sites can be responsive? 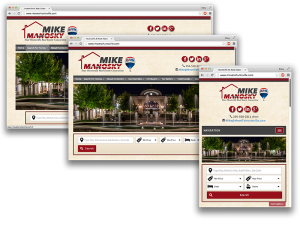 Any of our sites and blogs can be responsive. WordPress websites can be created with responsive in mind just as easily as our custom sites. The first and second of our examples above are custom sites, SizzlingStudios.com is built on wordpress! Unfortunately, not all IDXs are compatible with responsive design. If you are looking to create a mobile friendly website, but you have an IDX in mind, be sure to ask them if they cater to responsive! This is by no means a comprehensive list. If you have a different IDX in mind, remember to ask them about responsive! If you need help asking the right questions, we can assist you. Responsive design is by far the best way to make your website mobile-friendly, but in most cases it calls for a complete redesign of your existing website, which can be costly if you were not already planning on a redesign. For a small monthly fee, these third party applications will automatically create and host a mobile version of your website that is based on your current live website. This site can then be modified using their tools. When a user visits your website, a check will be done to see what kind of device they’re using. If they are using a smartphone, they will be directed to the mobile version of the site. Because the mobile site is a standalone version, it needs to be updated when your website is updated.